With the recent mobile import policy announced by the Government, I did some research and have compiled questions and answers to clarify some point. There is a lot of confusion on how many and what kind of mobiles can be imported so I have made these FAQs for your help. Q1. How many mobiles can be imported? A. There is no limit on the number of mobile phones that you can bring into Pakistan. Q2. Wait, what? Then why are people saying that we can only import one mobile? Well it means that you can bring one unregistered mobile duty free but any additional ones will be subjected to duty. Q3. What do you mean unregistered? A. Every mobile is assigned a unique number called IMEI. If you are bringing a mobile whose IMEI is not registered with PTA then it means you need to register it before it can be used. There is no duty on first mobile but any additional mobiles are subject to duty. Q4. Can you explain it more? A. Suppose you are currently in Pakistan and have 4 mobile phones each running SIM of Ufone, Telenor, Jazz and Zong. Let's say you go outside Pakistan taking these four mobiles with you and then come back after some days. You don't have to pay any duty nor register them because these mobiles are already registered in Pakistan. Q5. Who registered these mobiles? A. Any mobile phones you used in Pakistan before 1st December 2018 containing Pakistani SIM were automatically registered with PTA. Remember that campaign by PTA where it asked you to SMS the IMEI number of your mobile to can check whether it is registered or not? That was PTA way of saying "hey guys you must register your mobile's IMEI by making/receiving a call or SMS or sending this IMEI to us before 1st Dec to get registered". In fact for most mobiles you didn't even have to do this as they were brought through legal channels by paying custom duty but there is still a number of mobiles smuggled so this exercise was just to be on safe side. Q6. Ok now this is starting to make sense. So custom officer at airport can confiscate mobile phone? A. No they cannot. This scheme is voluntarily and custom officer cannot confiscate your mobile. But of course if you didn't register, you won't be able to use it in Pakistan. Q7. Ok then how do I register? A. There are two ways. First is the easy way where by you fill out this form, and give it to customer officer at the airport while coming into Pakistan. He will make necessary arrangements to register your mobile. If you don't want to do that for one reason or another then you can take your mobile with you at home BUT you must visit custom house in your city within 15 days to register it. Q8. What if I bring a mobile which has other country's SIM in it. Will it work in Pakistan? A. Yes if roaming is on then you don't have to worry. That mobile will continue to work for 30 days. Q9. Where are different custom houses in Pakistan? Q10. What is the duty structure? Use the information given below to calculate your duty. Thanks for the writeup. It cleared a lot of things in my mind. Agar mobile dual sim ho to tax to aik he ka dena ho ga na? (12-20-2018, 11:05 AM) adnan12 Wrote: Agar mobile dual sim ho to tax to aik he ka dena ho ga na? 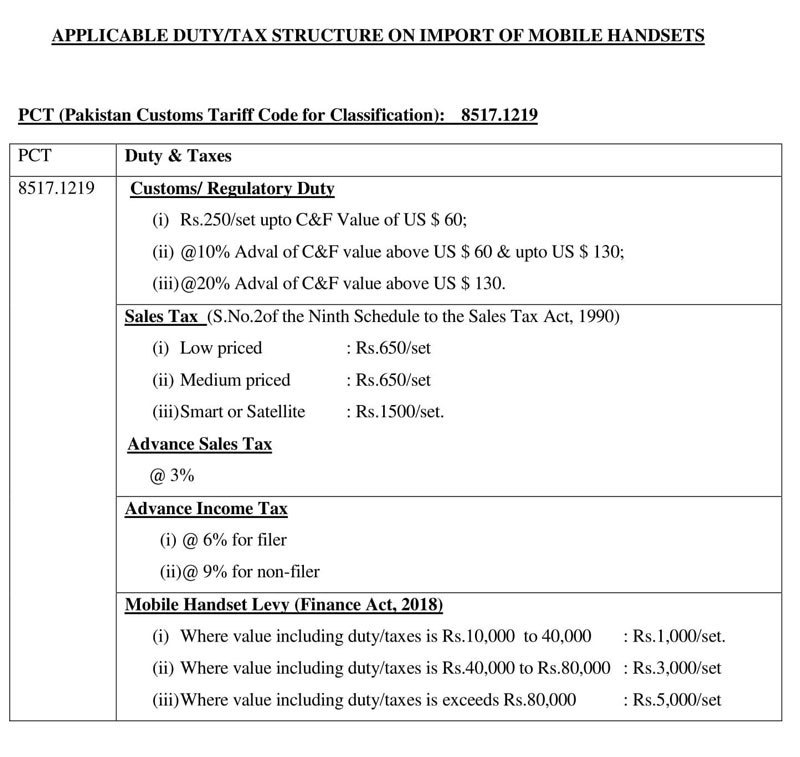 Yes tax is per mobile not per IMEI. How to register mobile phone with PTA?